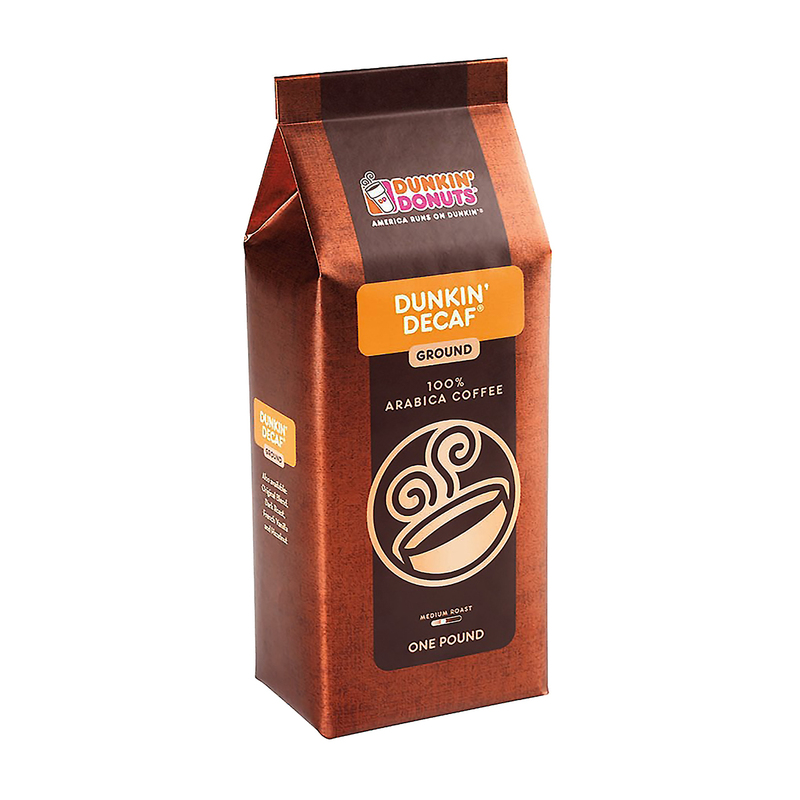 > Dunkin' Decaf™ Ground Coffee, 1 lb. You love the fresh taste of Dunkin' Donuts® Original Blend coffee but don't always need the extra boost. Now you can enjoy the flavor you want without the caffeine when you order our packaged Dunkin' Decaf® Ground Coffee. Each cup dazzles your senses with a soothing aroma followed by the vivid taste of premium beans. Fulfill your taste cravings day or night by brewing a pot of our delicious decaffeinated blend. We ensure quality in all of our coffee blends because we always use 100% Arabica beans, which the industry regards as a superior grade of coffee. Our coffee experts carefully select and roast each bean to provide you with the highest quality that represents Dunkin'. This decaffeinated coffee contains the same rich aromas and flavors of our highly rated Original Blend, so you don't miss out on any of the taste. Pour yourself a cup in the evening, and savor the full-flavored satisfaction you know and love. Our packaged coffee contains the same freshness and great taste that you would expect from one of our 10,000 restaurants globally. Call this blend your anytime coffee. This 1 pound package gives you all the flavor of our famous brew minus the caffeine, so you can indulge whenever temptation strikes. Our secret, special recipe, which approximately 2,000 beans go into making just 1 pound of Dunkin' coffee, makes a great gift for friends, family and coworkers who also appreciate great taste. 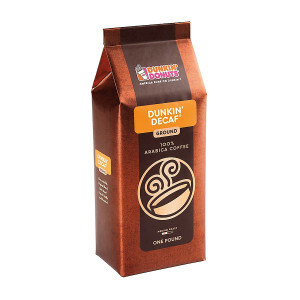 Order a pound of Dunkin' Donuts® Dunkin' Decaf® Ground Coffee to brew a pot whenever you feel the need for rich flavor with a smooth finish. French Vanilla Ground Coffee, 1 lb. Hazelnut Ground Coffee, 1 lb.